Bijou Basin Ranch: "I Love This Yarn" Photo Contest! 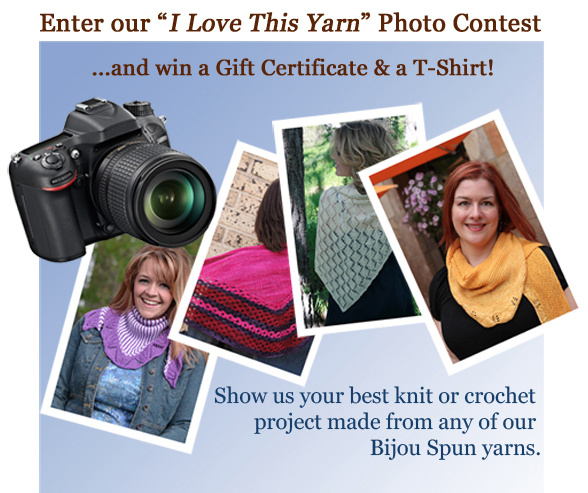 "I Love This Yarn" Photo Contest! Welcome to the brand-new Bijou Basin Ranch blog! Each month, we'll be sharing inspiration for knitters and crocheters along with sneak peeks behind the scenes - photo shoots, fiber events, adorable yaks....and contests, too! The top 10 entries will also receive a FREE Bijou Basin Ranch T-Shirt! Click here to find out how to submit your entry; you can read full contest rules here on our website!